Parad Shivling is made from mercury. Mercury when purified and brought to a solid state is called the Paras Mani (Mercury). As per Holy Scriptures, Parad Shivling is a Mahalinga and has a distinctive spherical shape. 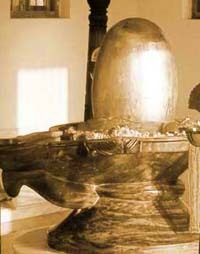 Solidification of mercury is a difficult process and this makes the Shivling unique. Science of mercury solidification has been known to India for 7,000 years, since the time of the Indo-Saraswati civilization. Yes it can be worshipped at home but make sure you are buying Parad Shivling. There are many people today claming they are selling parad Shivling but there is no test done to prove whether the claim is true or false. From the point of devotion, Parad Shivling is as same as stone Shivling. Only the property of mercury makes the Shivling different. When there is unwavering devotion it does not matter what form you are worshipping.